Ceiling medallions are known to be accents to beautiful light fixtures, but that is not the only use they have! Our recent customer, Lorraine from Maspeth, New York purchased multiple medallions and rosettes from the Ekena Millwork line and used them to decorate her room. She painted them to match the colors of her bedspread and we thing it looks absolutely perfect! 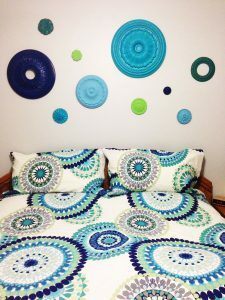 The medallions and rosettes add character to the wall behind the bed and the color definitely makes them stand out! 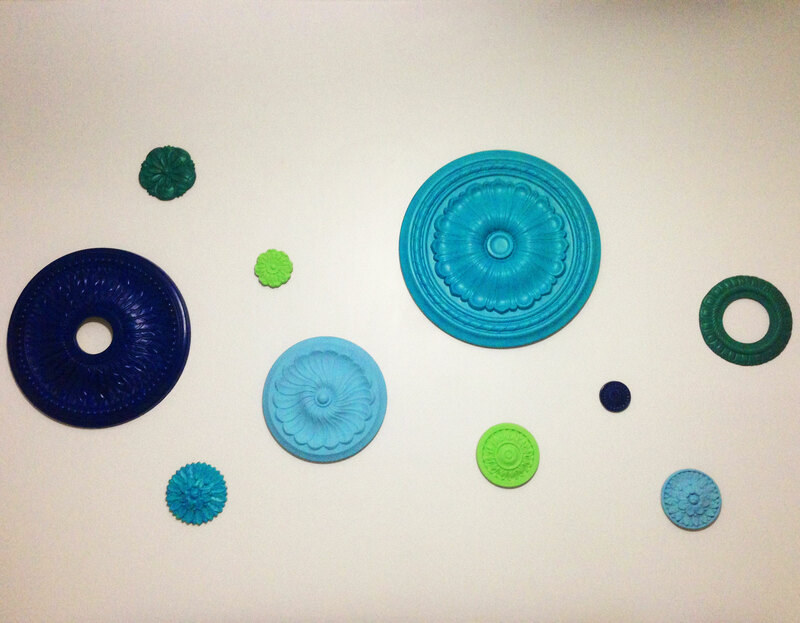 The Ekena Ceiling Medallions are durable, yet lightweight because they are made from high-density urethane. When the product is ordered, our warehouse team puts a coat of primer for the customer to easily paint or apply a faux finish. Additionally, customers can install the medallions with two easy steps of adhesive glue and fasten with a pin nailer. Finally, the medallions are in stock and available for immediate shipment! Ekena Millwork rosettes make the project by our customer picture perfect! The small rosettes beautifully contrast the larger sizes of the ceiling medallions. Like the medallions, these rosettes are made of solid urethane thus making them both lightweight and long-lasting. Typically, rosettes are used to accent pieces of cabinetry, furniture, and other pieces of moulding, but with Lorraine’s project, that was not the case. Those rosettes simply became the perfect wall décor! Finally, the Ekena Millwork rosettes ship within 24-72 hours so they are delivered to customers in a promptly manner. If you are interested in more Ekena Millwork ceiling medallions, please click the link here! If you are more interested in the rosettes, please use this link! Pictured are the following medallions and rosettes: Bailey Ceiling Medallion (CM18BI), Medway Round Rosette (ROS02X02ME), Helene Rosette (ROS03X03HE), Logan Rosette (ROS03LO), Ashley Rosette (ROS06AS) and Chesterfield Rosette (ROS06X06CH).